Are you a fan of the kitchen table? Print booster packs at home with our Pack Generator, or build the decks how you want with our PDFs for home printing. Print, cut them out, and slide them in front of a sleeved card before challenging your best friend to a Star Wars showdown. Download the Pack Generator and PDFs! Join us at the subreddit /r/swtg! There you can find a free digital download of the set to play with other Star Wars fans online. 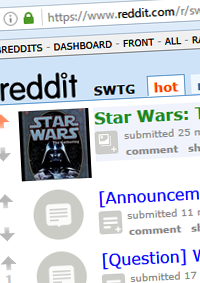 Visit /r/swtg to talk strategy, find players, and stay in the loop on updates such as the new SOLO expansion! The best way to play! When you want your cards to look and feel like real Magic cards. We created higher resolution images made with bleed edges for professional factory 300-dpi printing. 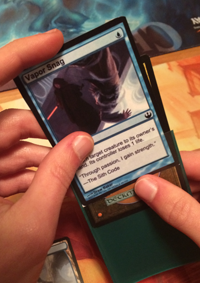 You can order a printing of the SWTG draft cube here! This site is not affiliated with Wizards of the Coast LLC, Hasbro, or Lucasfilm Ltd. This is a fan-made site and is used for entertainment purposes only. 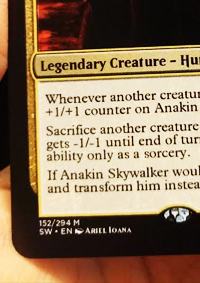 TM & © Lucasfilm Ltd. © 1995-2016 Wizards of the Coast LLC, a subsidiary of Hasbro, Inc. All Rights Reserved.